Returning home one spring five years ago from a secret visit to Beijing in his armored, fully wired train car, North Korean leader Kim Jong Il got an unnerving, firsthand demonstration of the potential downside of technology. A huge explosion ripped through the Ryongchon border station, and some officials initially thought it was an assassination attempt triggered by a cell phone. As it turned out, the fireball was more likely the result of two trains' colliding nearby, possibly as a result of miscommunication about changed schedules stemming from Kim's clandestine travels. But regardless of the actual cause, that still mysterious incident, which killed or injured 1,300, persuaded Kim to temporarily shelve plans for extending cell-phone coverage beyond the 20,000 wireless phones registered in the country at the time. That may not seem all that surprising for such a closed society as North Korea's, now locked in a heated standoff with the West over both its nuclear-weapons program and its jailing of two U.S. reporters. But even amid those tensions, the Hermit Kingdom is trying to stimulate its dire economic fortunes by slowly opening its economy to foreign business  and the lack of convenient cell-phone service has emerged as a major irritant, especially for the hundreds of Chinese firms active there, which make up the largest group of foreign investors. Those investors now actually have an ally in Kim Jong Il, who has quietly reversed his earlier decision and started upgrading the country's dilapidated communications infrastructure. Toward the end of last year Orascom Telecom, the Middle East's largest wireless firm, was awarded a contract to install a national cell system. The 25-year contract, in a joint venture with the North Korean state telecom entity, calls for a $400 million investment, which Orascom doubled down on by also investing in a bank and hotel project in Pyongyang. The country's Dear Leader has quietly launched an educational offensive to ramp up his country's computing skills and build an internationally competitive IT industry, moves that experts say have been strongly encouraged by Kim's oldest son, Jong Nam, who directs the Korea Computer Center. Grade-school kids are now drilled in Pascal and other computer languages, while gifted students are channeled into science and technology programs at Kim Il Sung University and Kim Chaek University, which some have dubbed the MIT of North Korea. Although currently stalled because of troubled bilateral relations with South Korea, another technical university, Pyongyang University of Science and Technology (PUST), is scheduled to open soon; foreign professors are supposed to eventually teach there, in English. "They understand IT is critical for their development," says Frederick Carriere, executive director of the New Yorkbased Korea Society, who plays a pivotal role in bilateral programs with both halves of the Korean peninsula. This includes helping to broker a seven-year-long academic exchange between Syracuse University and Kim Chaek, which recently was able to open the country's first digital library, using open-source software. "I'd like to see more incentives for the DPRK to participate in this kind of standards-based [open-source] work, because through that participation, you get investment in the world of the sort that presumably reduces the likelihood of certain types of conflict," argues Stuart Thorson, an IT and governance expert at Syracuse who oversees the program with Kim Chaek, which he says has been hampered by ineffectual U.S. export controls. Those export controls, of course, are just a symptom of the growing international tensions between Pyongyang and the West. Whether it's the country's recent nuclear tests and heated rhetoric directed toward its southern neighbor or the standoff over its jailing of two U.S. reporters, the unstable relations make it more difficult for Kim to deliver on his IT promises. Even more problematic are the regime's overriding security preoccupations. Key power and telecom transmissions are buried underground, which complicates much needed maintenance and upgrades. More communications also means eroded state control, which is a vital regime concern. There are currently only a little more than 1 million domestic phone lines  about 5 per 100 inhabitants  although just 10% belong to individuals or households. Unauthorized international calls abroad can lead to fines and arrest and in one case reportedly led to the public execution of a plant manager in October 2007, according to Good Friends, a Seoul-based aid organization. The same fears of the outside world will mean a very cautious and slow opening of the Internet, which is now reserved for trusted government officials and foreigners. "It would be nice to think that a new high-tech day is dawning over North Korea, but that would be a mistake," argues David J. Smith, chief operating officer and director of the North Korea Project at the National Institute for Public Policy, a U.S. foreign policy think tank. "North Korea's high-tech ventures will fail to save its economy without a systemic overhaul, of which the regime is incapable." Given a chance, though, North Koreans' native intelligence does flourish. Two years after first entering a team in the IBM-sponsored Computer Olympics (the International Collegiate Programming Contest), the North Koreans made it into the finals. "They are capable of handling very complicated software, and the results are extremely good," says Paul Tjia, a Dutchman whose GPI Consultancy has arranged for several European clients to outsource work to North Korean programmers. At Seoul's Unification Ministry, IT expert Lee Duk Haeng says Samsung and Korean Telecom are among a handful of South Korean firms currently using North Korean engineers. There are already hundreds of North Korean software engineers working in China, in border cities and elsewhere, according to Heejin Lee, a professor at Yonsei University, who has conducted fieldwork in the region. Most work as subcontractors for South Korean, Japanese or Chinese firms  sometimes in joint ventures  and Lee says there are numerous clandestine firms. The North Koreans earn high marks for their scientific and mathematical skills and come substantially cheaper than their Chinese counterparts  $300-$500 a month, one-third the cost of a Chinese engineer, or half the price of an Indian one, he says. Experts in South Korea, which is far more advanced, are skeptical. Targeting software development is a good way to earn foreign exchange quickly, agrees Dr. Kim Yoo Hyang, an expert on DPRK IT policy at South Korea's National Assembly research service. 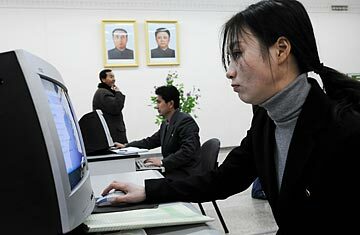 But she insists "it is safe to say North Korea's IT-sector development has not moved beyond its incipient stage." One question for foreigners is how actively to encourage North Korea's Internet integration. An initiative of the American Association for the Advancement of Science  also currently stalled because of the recent chill in bilateral relations  would pave the way for North Korean access to a wide swath of online university databases. That could provide critical assistance to Pyongyang's multiple development challenges, including growing enough food to feed its people; the country suffered a famine in the mid-'90s that claimed 2 million to 3 million lives and still suffers chronic malnutrition. But North Korea's pronounced track record of mischief and crime could make a greater Internet presence a mixed blessing. Some observers worry that the desperately poor country might be tempted to try its hand at any number of cybercrime ventures. North Korea already has a small (100 personnel) cyberwarfare unit trying to hack into U.S. and South Korean military networks, South Korea's Yonhap news agency reported in early May. The report came a day after Seoul's Defense Ministry said it had signed an accord with the Pentagon to strengthen its cooperation in fighting against cyberthreats. Read about growing economic ties between South and North Korea. View TIME's Pictures of the Week.